Something changes in the air when fall is upon us in San Francisco. It’s not so much a day or a time for me, it’s always been a feeling. Fall is unexpected and has always been a moment of surprise. It happened this year at the ballpark during batting practice. I was standing on the field in my daisy dukes, just soaking up the sun and watching the guys when a cold guest of wind swept through the ballpark. It left goose bumps on my arms. One of the coaches stopped mid sentence and changed his entire batting speech to describe fall wind. He went into depth on how the wind shifts in the fall to affects pitches, batting and the ball in mid-air. That was the moment I knew fall had officially begun. My favorite part of fall is pumpkins. I always have a sugar pumpkin on hand for pie and pumpkin pie ready for football games. 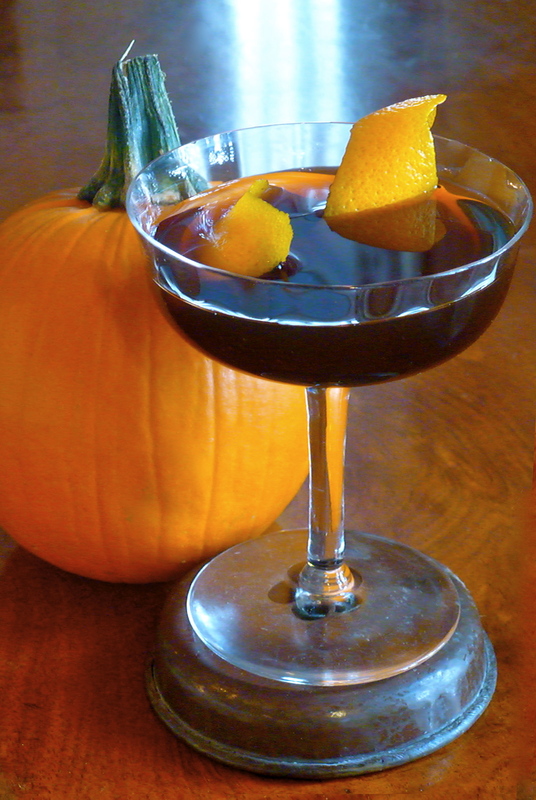 When thinking about putting pumpkin into a cocktail everyone I asked seemed skeptical. With a big, blushy, excited smile I would ask, “ I am going to make pumpkin infused bourbon. What do you think?” And all I got were blank stares. I have to admit this recipe took a few trial and errors. I didn’t mind because my entire house smelled like pumpkin pie for a whole week, it was heavenly. This cocktail is pretty straightforward. I chose George Dickel number 12 for it’s layers of spicy toffee, caramel, walnut and fall spices. Trust me on this one; don’t consider any other whisky just go for the Dickel. Combine all ingredients in a beaker with ice. Stir well. Fine strain into a chilled martini glass. Garnish with a flamed orange peel. Enjoy. Combine all ingredients. Bring to a boil. Turn the heat down and simmer until liquid is reduced by half. Let cool and fine strain into an airtight container. Preheat a convection oven to 400 degrees. Cut pumpkin into one-inch pieces lengthwise. Place pumpkin on a cookie sheet. Combine all ingredients. If the honey is too cold making it hard to stir – place the container in your microwave for twenty seconds. 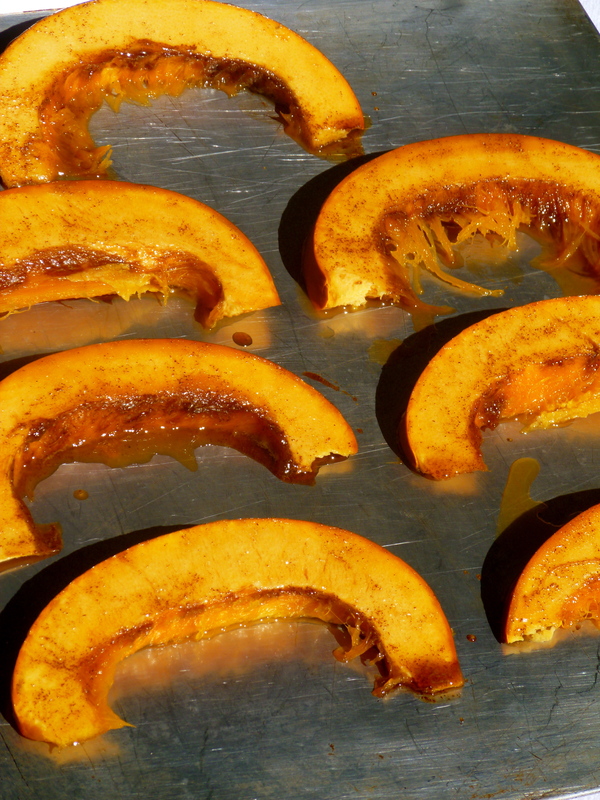 Baste pumpkin slices with mixture. Let cook for about an hour or until pumpkin becomes tender. Turn pumpkin pieces halfway though and baste the other side. 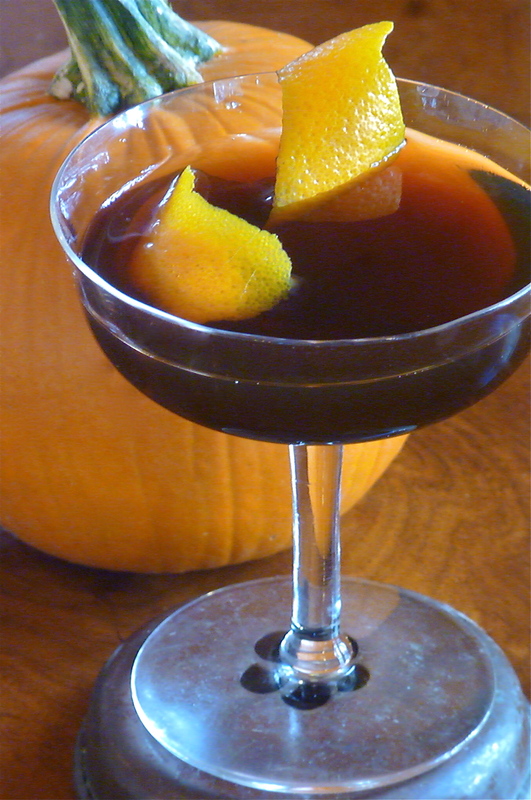 Place pumpkin pieces into an airtight container; pour 750 ml George Dickel over pumpkins. Be careful to make sure all of pumpkin surfaces are submerged in alcohol. Store in a dark place for two weeks.